Golden Temple or Sri Harmandir Sahib Ji, is located in Amritsar, Punjab (India). The Golden Temple, also referred to as the Darbar Sahib, is of significant importance to the Sikh faith. The location of the Golden Temple, originally a small lake in a deep forest, has long been recognised as a place of spiritual significance. 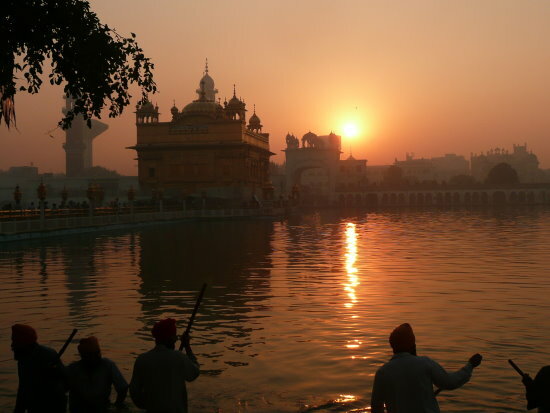 It is said that Buddha spent some time there, and later the first Sikh Guru, Guru Nanak Dev Ji, meditated at the Lake. Subsequent Sikh Guru’s further developed the site, and soon the the city of Amritsar grew around the Harmandir Sahib. From simple beginnings to the current striking Golden Temple, it is a truly unique, and for the Sikh’s a central, place of worship. In and amongst the hustle and bustle of India stands a timeless place of worship, where one can listen to enchanting hymns that captivate both devotees and tourists alike. “I have seen many places, but none like Thee” – Sri Guru Arjan Dev Ji. Golden Temple Amritsar.co.uk soughts to provide information about the Gurdwara (or Temple) from the early history to the present day. General visitor information together with photographs and art capturing the Golden Temple through the ages will give you an insight into the place and people that have been touched by it. Golden Temple Amritsar.co.uk is in no way affiliated to the SPGC (Shiromini Gurdwara Parbandhakh Committee) the organisation responsible for the day to day running of the Temple complex. Any information or inquiries about the Golden Temple should be directed to the SPGC. Golden Temple Amritsar.co.uk offers you information about visiting the Golden Temple, and hopefully will facilitate a pleasant stay in Amritsar. If you have any questions, comments or further suggestions that you feel would be useful for other visitors, please let me know via the Contact form.